Well, this night started in the day. It’s Saturday, so it’s Clutch day at the K. I knew that Tita Ruby, Samantha’s mom is leading yoga with the Clutchers (Clutch Program @ KAPISANAN). Every once in a while when I really need it, I join the yoga class. Today the theme was mindfulness. Breathe into the challenge and release. Tita Ruby is holding my hand and leading me on the good path of light. It was killer. Today, JR, Christine Balmes (a.k.a. CB4) and Sammy Jade were leading the workshop to teach the Clutchers about the kulingtan. It’s brass gongs in different sizes with different tones. The kulingtan is the main music accompaniment to, you know, that beautiful dance coming out of Mindanao, in the south, the Muslim Princess named Gandigan, her audacious fan play and the slave girl with the parasol, the two of them stepping like butterflies in between raptor-like bamboo sticks that slam together in a sick rhythm that puts you in a trance. If you don’t know about that, then I just dropped you morsel there to chew on. Anyway, I didn’t sit in for the history part. I was as usual back in front of my computer sending out a reminder to the mailing list about the night market @ KAPISANAN’s new community partner, Rolly’s Garage, that night. At the same time, on the phone trying to appease the landlord for the noise the music studio was making after 10pm the night before… for the 13th time again this week (big ups Jim!!) And making cash floats for the night market and the Music Neighbor party right here inside the K bashment also tonight. Over the next 3 hours, the Clutchers managed to record a bit of a crazy kulingtan jam with JR inside The End studio (inside the K too w Jeremy Glenn). Bea and Sammy Jade recorded vocals over the kulingtan. If you want to hear that recording you need to come to the Clutch final exhibit at Rolly’s Garage February 14, 2009. Hollerrrr! Right after the Clutch sesh, straight to Rolly’s Garage with CB4 to set up the K table. Teamsofierce a.k.a. 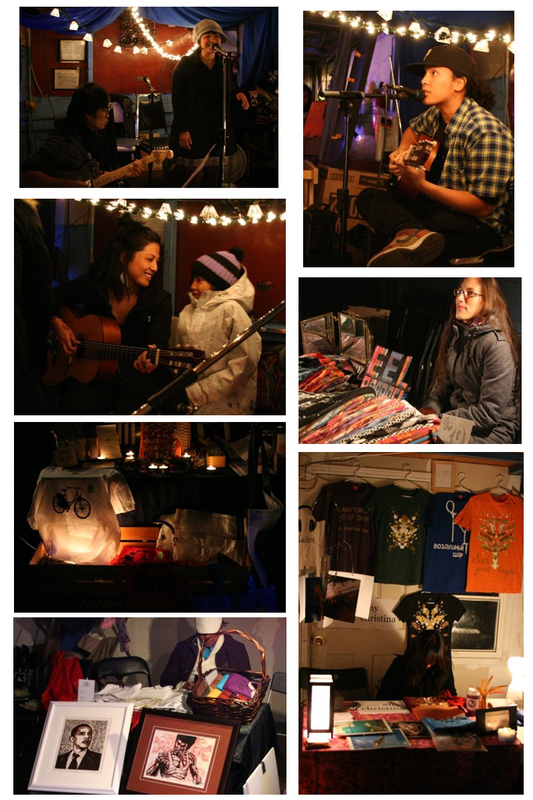 Robin Lacambra and Tiffany Naval (both K members, Tiff is the coordinator of the Clutch Program- Queen T) are grinding it out with this November Nightfall Market at Rolly’s Garage which ran from 6pm til midnight. By the time we got there, the place was already full of people. All the 16 vendors were scrambling for the 8 tables that were available to lay out their wares. With some creativity, everyone had their merch laid out as the shoppers started to come in through the tent chilling under the open garage door framed with fancy little lanterns. Passers-by were just too curious to not stop and look in. I have to say my feet were pretty much popsicles for the whole night, but that spiked apple cider warmed it up for a hot minute, and no I don’t do egg nog. The shopping was crazy. Folks were selling crafts, barely worn Nikes, wood block prints of Obama (yes we can! ), vintage jewelry, and even Warm Fuzzies. The music line up was curated to much perfection. Lianne Aliermo was whispering out something jazz with Phil on the guitar --JR rocked out, and I mean worked it out on an old organ. You know the kind that’s been collecting dust in your parent’s basement since 1987. The wee little mini kind of organ with two tiers of keys and a bunch of flippy switches with the bossanova beats; freshly painted white no less. Romeo really made the older white folks do some serious head nodding on that loop pedal. Andreena Mill is really so dope on the keyboards (www.andreenamill.com). And then Sammy Jade.. so lovely it made everyone stop what they were doing and shut the *%@$ up. It was really quite magic—I never say “magic”. Ever. Auspicious. Nor do I ever say auspicious. All this happened in Tito Rolly Orbeta’s, Robin’s dad’s, garage on Ossington Avenue. For real, the greasy metal shelves of motor oil and car parts were just covered by huge satin sheets. No less. Ok, background is in order: Tito Rolly is now retiring from his 25 year long run car crafting on Ossington. As of Dec 1, Robin and Tiff are taking it over. 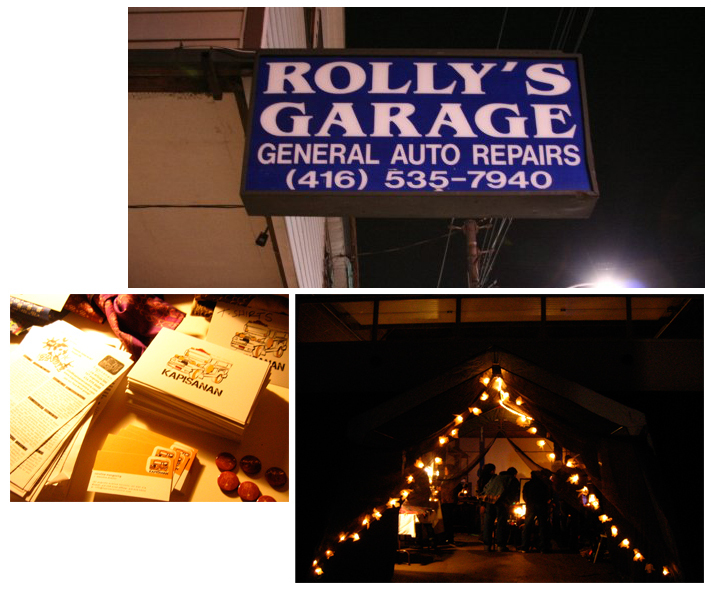 Rolly’s Garage (the name is staying),is transitioning from garage into creative space, continuing the legacy. Some real Toronto stories have happened in that garage. If you didn’t already read about it in the Globe and Mail, or Martini Boys (http://www.martiniboys.com/Toronto/articles/Remaking-Rolly%27s-Garage-on-Ossington-11319.html) , the space is now a venue for art exhibits, yoga classes, night markets, theatre shows, film screenings, launch parties, and other such festive and creative activities, and soon some of KAPISANAN’s exhibits and performances too. Rolly’s Garage check them on Face Book, www.rollysgarage.com coming soon. So anyway, I am so not even done yet. After the garage door closed for the night, we ran back to Kensington Market to hit the Music Neighbor party at the KAPISANAN bashment. It just so happened it was planned on the same day as the nightmarket. A collabo between Multi, the streetgear shop in the store-front of KAPISANAN (167 Augusta ave, in case you have been sleeping inside a rock buried in a collapsed underground riverbed), KAPISANAN of course, lead by our Fundraising chuva-la Queen of ever, Christina Santiago (a.k.a. Tina), and get this, 663A. What, or who is that? I wish I already know the reference of their name, but I still have to ask them. Anyway, they are this crazy banana collective of Japanese urban artists; dancers, djs, MCs, singers, breakers, and all. A crew of us rolled in at 12:30am, gear in tow from Rolly’s Garage. After being a spiked popsicle for the last 6 hours, we walked into a wet wall of hot, humid madness. Thawed out quick. MasiaOne was on stage seriously killing it with about 4 guys behind a table, 2 turntables, a couple of laptops, other random audio gear, and two seriously hot Japanese girls shakin’ it in rolled down cut off denim booty shorts and cropped tops, navel dangly thing and all. Trust me, that description sounds like so much dirty inappropriate stuff, but let’s be real, it wasn’t like that at all. Because if you saw the whole picture of all of that, and the stage is dripping with silkscreened patterns on pieces of paper and projected images of oil paint on a platter of water changing the color of light on the faces of people—all the visuals were thrown up by Exploding Motor Car Collective (what up Jeff Garcia and Winston! www.explodingmotorcar.ca). Jeff and Winston are wearing these masks they fashioned out of the same patterned paper cut like the are 2 ft long feathers, Jeff told me it was his homage to the Ati-Atihan Festival in Kalibo. Sick. So SICK. So much so that that whole night inspired me to write this. I may have mentioned before I don’t blog. Ok wait Japanese dancehall, in a Filipino arts & culture centre basement, with a pair of young clothing shop proprietors from Korea and New Zealand (Sun and Sam / MULTI yeeeaah!). We are changing it up, I reckon. I think this was representing means. It’s natural. We make it look easy, easy, easy. Breathe into the challenge… and release. Mind full. Yo, holler at your girl.